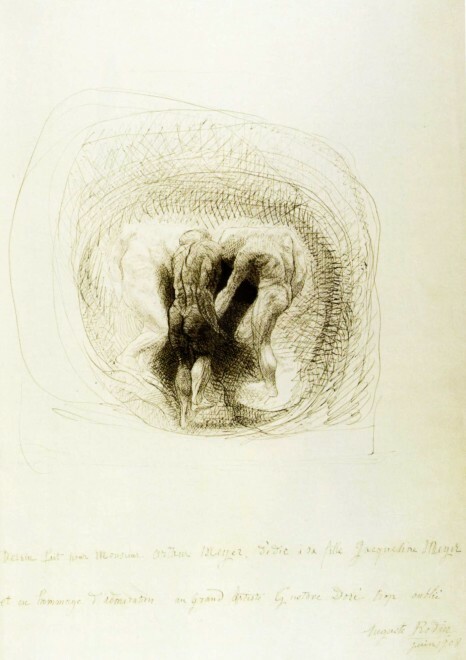 Dessin fait pour Monsieur Arthur Mayer et sa fille Jacqueline Meyer et en homage d’admiration au grand artiste Gustave Doré trop oublié, Auguste Rodin Juin 1908’. This wonderful drawing with its moving tribute to Gustave Doré shows the three towering figures in Rodin’s major sculpture The Gates of Hell looking down upon the wreathing ferment of damned souls. The drawing was inserted as the frontispiece of Arthur Mayer’s copy of his publication of Doré’s illustrations for Dante’s Inferno. The three figures, in the drawing and sculpture, are reproduced above. I lived a whole year with Dante, drawing the eight circles of his Hell. At the end of that year, I saw that while my drawings rendered my vision of Dante, they were not close enough to reality. And I began all over again, after nature, working with my models. I abandoned my drawings from Dante. I followed my imagination, my own sense of arrangement, movement and composition. ‘The Gates of Hell’ was only cast after Rodin’s death in 1917.